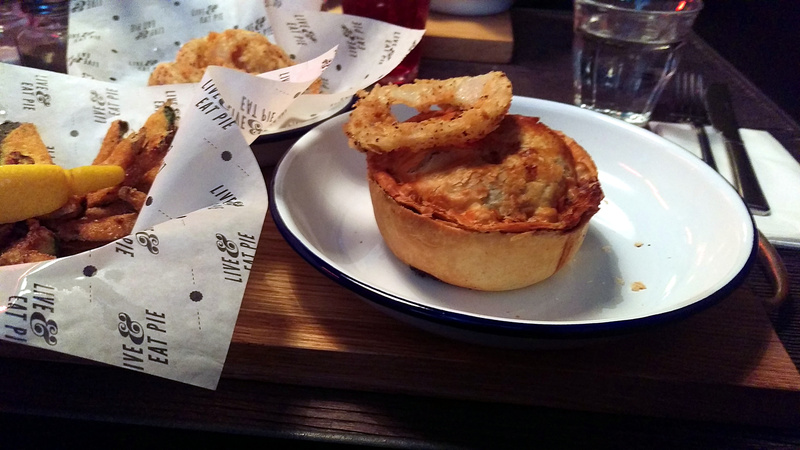 Pieminister’s Nottingham restaurant sees its small empi[e]re grow to 5 locations. Its original setting was Bristol where they opened their doors first time in 2003, the public consciousness of the brand has built steadily since, their pies getting recognition for tastiness over the years and recently the increased opening of restaurants. The offshoot in our fair city resides on Long Row, opposite the also new Taco Bell. 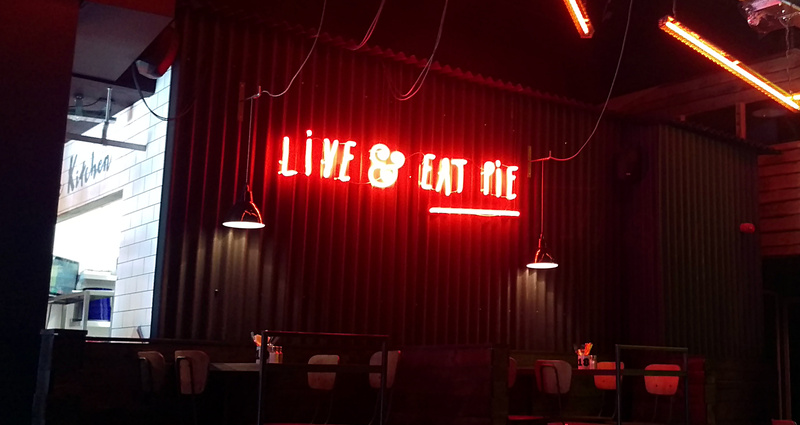 Black walls that neon signs and bright logos adorn are the dominant feature with the interior following the current vogue of concrete floor, wooden benches and metal accents. Their menu, shockingly, is dominated by pies but also contains hot pots and salads. The choices of their headline item range from the traditional steak pie to the likes of their Chilli Con Carnage, which is what I decided to try. Upon arrival my choice looked the most bereft of intrigued. Containing chilli con carne means a pie doesn’t lend itself to gravy, or mushy peas…and I don’t like mash. The result was a little pastry friend sitting alone looking a little tragic. I did have a couple of sides to supplement the main event, courgette fries and onion rings but they were in separate baskets. The first thing I noticed was that the pastry was genuinely excellent, I’d struggle to see how it could be bettered in this setting. My filing was quite seriously spicy (as advertised) and had plenty of meat, in this case vension. It was a good consistency, though without a separate gravy the filling could have been a little wetter. Both sides were enjoyable, fries simple but tasty and not too oily, the onion rings a little different as I think they were pickled before they hit the fryer. I was a pretty happy chappy with the bill. Pricing on their sides felt a bit keener, my two setting you back £3.20 each for a fairly modest portion. Not exorbitant by any means but seemed it by comparison to the £5 cost of any one of the pies. Ultimately the attraction of this restaurant to me is that it is something different. Yes you can get the equivalent at a pub maybe but it wouldn’t be as refined and well groomed. It also makes a nice change from the American, Thai and Indian restaurants to have something rather English.